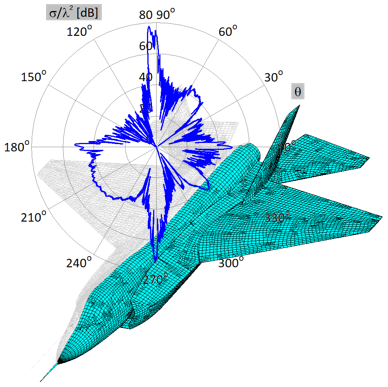 Especially important when simulating Radar Cross Section (RCS) of an airplane or a similar target, WIPL-D suite offers a great set of tools for full wave EM simulation of real life geometries at high frequencies. WIPL-D Pro CAD enables import of extremely complex geometries from all popular CAD files (such as models created in tools specialized for mechanical engineering), validation of models, and easy simplification of details obsolete for EM simulation (such as metallic screws). The in-house developed mesher performs subdivision of complex geometries into generalized quadrilaterals. The meshing is automated and extremely efficient to allow precise modeling of details, curvatures and small features while the requirements for EM simulation are kept as minimal as possible. After a proper quad mesh is created, WIPL-D Pro allows EM simulation in most efficient manner available among commercial tools (quad mesh, unique higher order basis functions, 30 unknown coefficients per lambda square for metallic surfaces, many features to further decrease number of unknowns but preserve the accuracy, very efficient CPU and GPU simulation on inexpensive hardware platforms, WIPL-D support team has years of experience in simulation of complex EM problems). The simulations include high resolution of monostatic RCS (F16 from 0.1 to 3 GHz, F35 from 0.1 to 4 GHz, F35 at 10 GHz by using DDS Solver), on multicore and multi GPU workstation, with simulation time measured in hours. 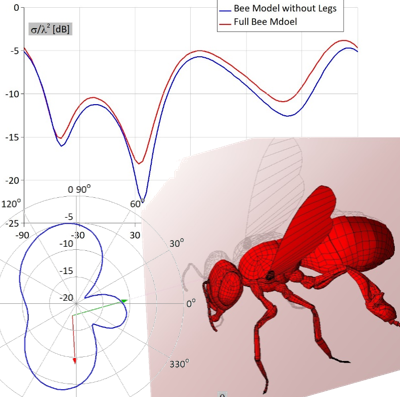 The body of a bee has been modeled as homogenous dielectric with high Er. Due to all the realistic details included in the CAD file, the simulation is far more complex than for simple RCS objects of similar size. In the first stage, the full bee model is meshed into over 6,000 plates and simulated on regular desktop PC (any modern laptop or desktop will do). In the next phase, the long and narrow legs of the CAD bee model have been eliminated. The results indicate that such model shows excellent accuracy but is order of magnitude easier for the MoM simulation. All simulations are carried out with the inherent bee symmetry. 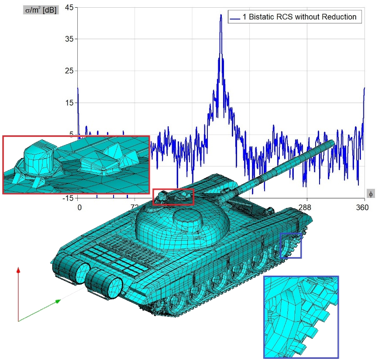 Bistatic and monostatic Radar Cross Section (RCS) of the tank T-72, at 3.6 GHz, are results of interest in this application note. Length of the tank is 7.4 m, 89 wavelengths electrically long. WIPL-D Pro CAD enables import of extremely complex geometries from all commonly used CAD, validation of models, and easy simplification of details obsolete for EM simulation itself. After a proper quad mesh optimized for EM simulations is created, WIPL-D Pro allows EM simulation in most efficient manner available among commercial tools. The focus of this application note is usability of the code on Amazon cloud server instead of local desktop or server. The server is GPU based with 8 Tesla V100 GPU cards. The software package is successfully installed on the machine, and no problems with its working is noticed during the work. The problem is solved without applying symmetry. The model originates from a detailed CAD file and all details were kept during the mesh and simulation. The incident RCS wave arrives backside in the horizontal plane. Vertical polarization is observed. The effects of reduction techniques are discussed for the monostatic RCS. All simulation times are measured in hours. Synthetic Aperture Radar uses signal processing to improve the resolution beyond the limitation of physical antenna aperture. Instead of a real antenna model, uniform plane wave can be used as an excitation. Plane wave illuminates each of the points located in the scattering area under the investigation. The target distributes the impinging electromagnetic wave to all directions; a small portion of the signal is reflected back and received by the antenna. 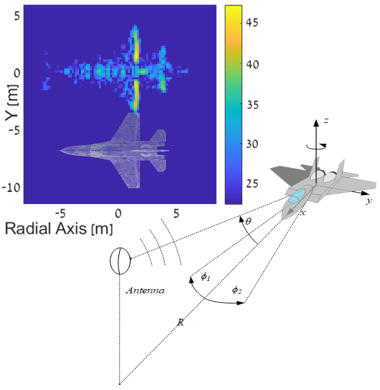 For the SAR image calculation of a 12 m long and 8.05 m wing span fighter’s aircraft, monostatic RCS simulation is performed in 76 equidistant frequency points, from 2 to 3 GHz, and 225 directions for each frequency. In order to reduce number of unknown coefficients and decrease the simulation time, two reduction techniques are applied: (A)Symmetry and adjusting simulation referent frequency to currently simulated operating frequency. The simulated SAR image is in good agreement with actual shape of the target, indicating that WIPL-D is very suitable for the very efficient analysis of SAR systems. The simulation is performed on GPU based workstation in approximately 2 days. 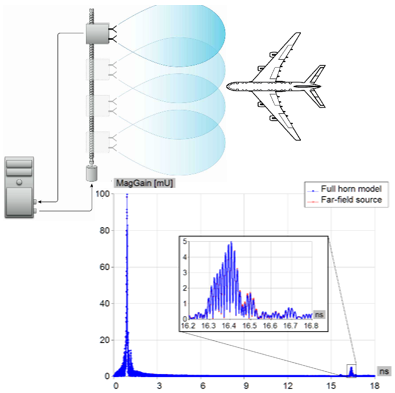 Here we consider a monostatic Radar Cross Section (RCS) analysis for a scenario when a surveillance radar is illuminating a zone where two aircrafts are approaching. In such a situation, a radar shadow can be utilized to deceive the radar system as it perceives only one aircraft approaching a target zone. Only the electromagnetic (EM) aspects of the simulated radar shadow scenario is investigated, i.e. only the monostatic scattering regardless the coding of the signal, frequency hopping, or some other radar system related feature. 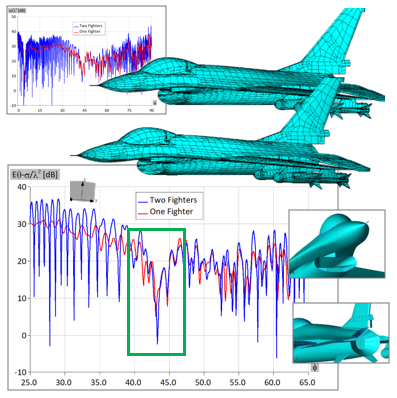 This application note explains manipulations and modifications of a fighter aircraft CAD model required to prepare it for the simulations. Then, the CAD model is meshed. The second aircraft is added to the modelling scenario in the next step and monostatic scattering is calculated for both of the scenarios – the first where only one aircraft is present, and the second where two aircrafts are included. In the two-aircraft scenario, the aircrafts are positioned so that for the case of the radar illumination from the angle of 45 Degrees one of the aircrafts remains hidden as it lays in the shadow created by another aircraft. The scenarios are simulated at 1.3 GHz (widely used frequency in radar surveillance). WIPL-D software is successfully used for simulation of this radar shadow scenario. The simulations of this electrically large radar shadow scenario are performed using WIPL-D software without applying any reduction of the number of unknowns. All the simulations are performed with acceptable simulation times. In the recent years, due to the integration of electronic devices into everyday life there is an increasing public concern about the impact of electromagnetic wave on the human body. Application note is focused to homogenous dielectric and equivalent metallic human body in the frequency range from 2 GHz to 10 GHz. The skin depth is between 2 mm at 10 GHz and 60 mm at 2 GHz. Because of the small skin depth at higher frequencies, the most efficient simulation model of the human body proved to be metal model with losses included in form of distributed loadings. The number of unknowns is greatly reduced , without reducing the accuracy of the simulation. 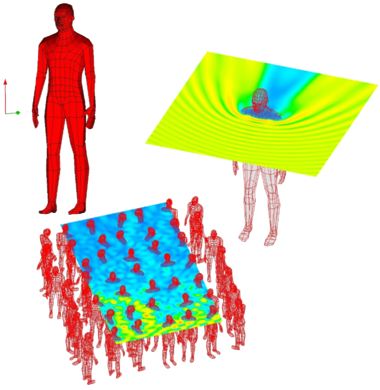 Simulations include: dielectric model of human body at 2 GHz, metallic model with distributed loadings at 2 and 10 GHz, human crowd with 49 bodies with properly distributed and random positions at 0.9 GHz. Computer configuration used is standard desktop PC with increased RAM and single inexpensive GPU card added for the matrix inversion speed up. This application note shows comparison between monostatic scattering from metallic and coated missiles. Three missile models are created and simulated by using WIPL-D Pro CAD. WIPL-D Pro CAD software is suited for easy and fast creation of complex 3D geometry models. It allows importing models from various CAD formats. It also allows creating models from the scratch using built-in primitives. The dielectric layers were added using WIPL-D Pro. They are added by using Copy\Layer manipulation applied after meshing the CAD model. It enables modelling of arbitrary thin layer where both surfaces of the layer are meshed in the same way. The same meshing of the close surfaces is very important due to accuracy of geometry modelling and due to simulation accuracy. 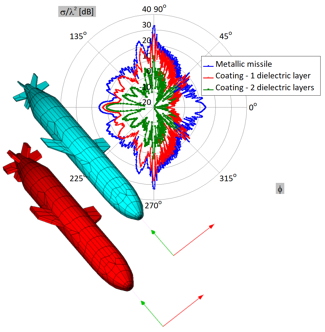 Three simulated models are metallic model, coating the missile with a dielectric layer and adding one more dielectric layer. The simulations were carried out on standard desktop PC empowered with low-end Nvidia GPU card. CPU is used for matrix fill, while GPU is used for matrix inversion. Monostatic analysis with many excitations is performed very fast, additional time compared to bistatic RCS simulations is rather small. Radar Cross Section (RCS) of trees is of interest in geosciences, propagation analysis in the vicinity of forests, radar applications etc. Full-wave EM analysis of such complex structure poses a challenge due to the geometrical complexity and the random nature. Decades ago, WIPL-D Pro was able to simulate wire models of stochastic trees. Wires of different radii with distributed loadings were used as modelling elements. This application note presents an advanced meshing algorithm for stochastic tree models and GPU accelerated solver. 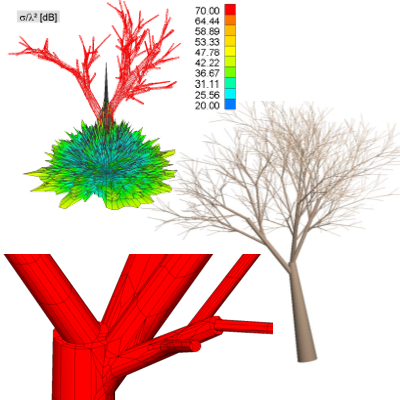 The tree models are completely automated closed surface, defined as dielectric with Er=10. Such simulation overcomes the fundamental limitation in frequency range for the wire models. The monostatic Radar Cross Section for tree at 0.2, 0.5 and 1.5 GHz has been simulated on inexpensive GPU workstation, with very low simulation time even for RF frequencies. Synthetic Aperture Radar (SAR) is a technique which uses signal processing to improve the resolution beyond the limitation of physical antenna aperture. In SAR, physical movement of the actual antenna is used to synthesize electrically large antenna aperture. Application note describes efficient numerical analysis of rail SAR system. The approach is based on MoM-SIE using higher order basis functions, reductions of unknown coefficients needed for the analysis, and the far-field equivalent sources. The simulation was additionally speed up by using multi GPU platform, where each frequency point is simulated at single inexpensive GPU card. For the GPU expander with 8 identical GPU cards, the simulation time has been increased roughly 8 times.